Sleeping is a daily recurring phase in which we can relax our mind and body, and is the primary way to recharge our body after a long, tiring day. Getting enough sleep produces positive effects on our health and beauty. Thus it is essential to have a full 8 hours of sleep a day. You can try these steps below if you want to achieve a cost-free, beautiful aura. Sleeping inyour back is a big help to get rid of wrinkles before they even start to form. Most of people tend to lie on their sides, squeezing their chests, stomachs, and faces into their pillows when they sleep. Allowing pillows and blankets to pull on your skin can lose the skin's elasticity and can lead to premature aging, as a result, wrinkles can deepen. Sleeping on your back is the finest way to prevent the formation of wrinkles due to too much pulling. Satin is a weave that features dull under part and glossy surface. Silk is an organic fiber composed of protein which is produced by specific larvae to form cocoons. These materials are essential in sleeping since it softens the wrinkles and fine lines. When there is less friction between your pillowcase and skin, it prevents the creasing and wrinkles. It also avoids breakage and tangling of hair strands. So better replace your pillowcase to start seeing the best results in just a few weeks. Day creams are favorable, but it is not enough to keep the moisture of our skin overnight. When we sleep, our skin loses water, so it is essential to use some supplement for extra moisture. Applying a night cream before sleeping can prevent odd and dry complexion. Moisturizing is the secret of having a wrinkle-free and younger-looking skin. Cleanse your face before getting ready for bed, then apply a heavy moisturizing cream to keep your skin hydrated. This method will help to avoid the risk of premature aging. 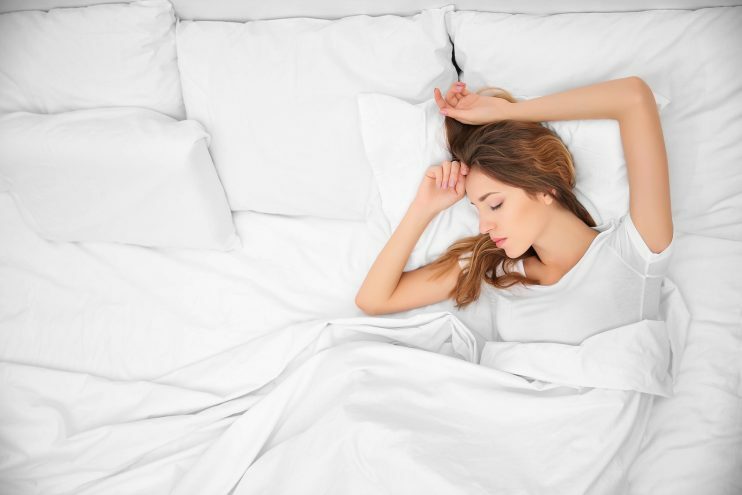 Inadequate sleep can lead your skin vulnerable to dehydration and dryness. You can try making soda water with lime or coconut water as it will help hydrate your skin during sleep. Avoid drinking alcoholic, caffeinated, and sugary refreshments such as soft drinks and energy drinks, which can leave your skin droughty. But the most efficient way to keep the wetness of the skin, drink plenty of water before sleep. Drink at least 3-4 glasses of water 30 minutes before sleep to provide best results. Keeping your hair away from your face during sleep is an essential way to protect your skin from further damage. Your hair typically accumulates dirt and oils during the whole day, that your face can absorb while you're sleeping. Tie your hair up but avoid pulling it into a strong ponytail, it will cause breakage around the hairline. Try to wrap it with a scarf. A loose ponytail is also a nice way to wear your hair up. Additionally, it will also prevent your hair from breaking and frizzing while in sleep. Having a good and comfortable bed is a big help in sleeping at night if you want to achieve a fresh look when you wake up. Sleeping on a hard and uncomfortable surface may lead to skin damage and may affect the quality of our sleep. Beds that are soft and bouncy will provide enough satisfaction and luxury from the time you sleep until you wake up. We spend the third part of our life sleeping, it is crucial not just in memory and growth, but it also affects our exterior appearance. Having a good and satisfying sleep will create a positive effect that can enhance our physical look. Try to follow the tips mentioned above if you want to improve your outer beauty. You will surely see the results if you keep the discipline to yourself. Author Bio:Caleigh Martin is a health and beauty enthusiast who writes about the latest trends in fashion, beauty and lifestyle. She usually attends seminars and conventions regarding the newest tips on beauty industry. When not in work, she to plays badminton or go swimming with her friends.